I got an amazing birthday (my birthday was back here on Feb. 2nd) present in the mail all the way from Jakarta from my friend Alessandra from homemade@myplace! She totally spoiled me! 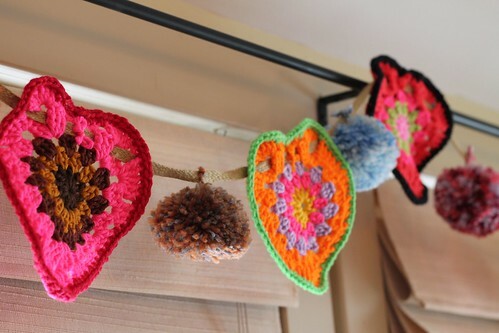 Some of you may recognize that the hearts are made from Jacquie's Sunburst Granny Hearts Pattern! 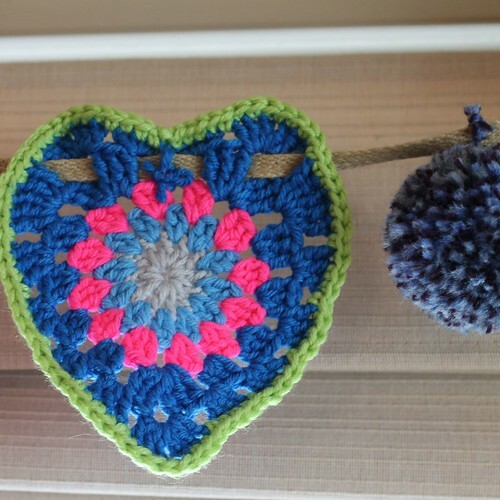 I just love how small and connected the crochet blog community is! And if that garland wasn't enough, Alessandra also gave me TWO Japanese crochet books since she knows I love doilies!! They're beautiful, and I can't wait to make something from them!! I was totally blown away and really touched by how much she did for me. When I started this blog I really had no idea how many great friends I'd make from all over the world! At first it felt like I had two separate worlds going on: the real world and the online world... But the longer I blogged, the more I got to know people, and now I have little things from my friends that I see everyday in the "real world," (like this garland now, and my owl keychain from Carly...), that make me smile and remind me that the two worlds aren't mutually exclusive. Anyways, this birthday present was so incredibly thoughtful. I still can't get over it. Thank you, thank you, thank you Alessandra!!!!!! You are right : it seems that 2 parallel worlds exist (the real one and Blogland), but seeing these photos I know that it is only one!!!! The garland looks very cute and colorful. 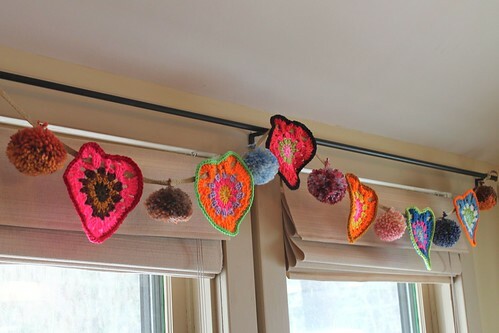 Great garland for your birthday (on Ground Hog Day!!!) 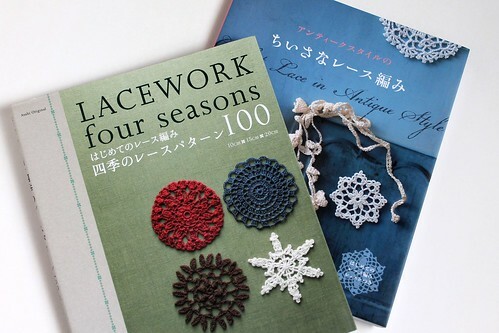 Those Japanese crochet books look beautiful. Don't forget to show us what you make from them! What lovely gifts :-) I agree; the blog world and the "real" world are often one and the same. Happy Belated Birthday! Oh, HaPpY BiRtHdAy Kate!!!! The garland is beautiful. Alessandra has such a knack for using bright fun colors. I can't wait to see your Japanese doilies!